When Amy Dee Smith first received her cancer diagnosis last year, she didn't feel like telling anyone. These days, that's changed — big time. Rather than cocoon herself off from the rest of the world, the Saskatoon woman decided to take her struggle online. She started writing about her experiences on Facebook. 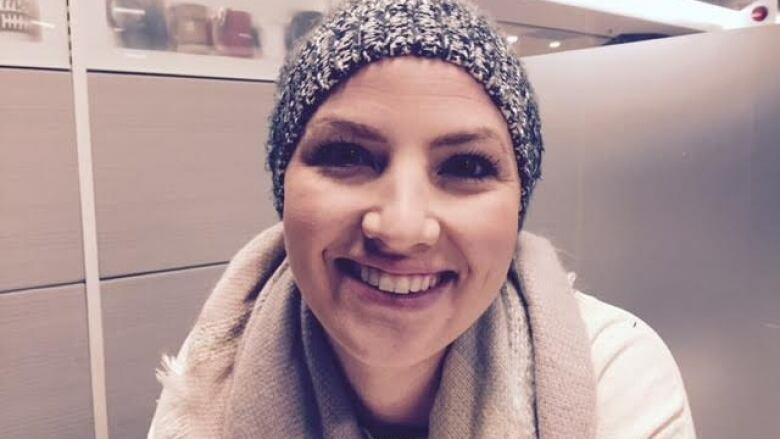 Eventually, she began live-streaming her chemotherapy sessions, answering the public's cancer-related questions in real time. "My family was having trouble coping with the news and not being able to share it," she told CBC Radio's Saskatoon Morning. "So, I opened up on social media. I got such positive feedback from the stuff I was sharing, I just kept doing it." Last November, Smith started to get extreme heartburn and went to the doctor. She was told she had ovarian cancer. "It's a huge roller-coaster," she said. "You go from thinking you're going to die to thinking you're going to be OK to thinking you're going to die again. It's a huge up and down for the first couple of weeks." So far online, Smith has been asked about everything from hair loss to how to support cancer patients. "You can actually show them: This is the chemo that is running into my veins right now," she said. "It really becomes less of the scary cancer machine that kind of eats people up, and it becomes a lot more tangible for people." Smith knows a lot about chemotherapy. For years, she has worked as a pharmacist at the Saskatoon Cancer Centre, focusing on treatment of children. Having to undergo chemotherapy herself has been an extreme education. "The chemo is exhausting," she said. "I definitely didn't understand it before as a cancer pharmacist. I had no idea how fatiguing chemo could be." She also has more understanding of how patients can fall off the treatment schedule. After her first round of chemotherapy, Smith's appetite returned, and she decided to treat herself by eating a box of Kraft Dinner. She soon discovered that was a big mistake. "I suffered the worst cramping of my life," she said. Even though she had told patients in the past to avoid big meals, she now understood that "you're so happy, you just want to eat anything." Smith hopes that her personal stories will take some of the fear out of a cancer diagnosis. "We often think if you have cancer, it's almost like you need a miracle or divine intervention to save your life," she said. "But we cure people, and people go on to live long lives."